Dr. Mustajeeb Khan, the faculty in the Department of English, Dr. Babasaheb Ambedkar University, Aurangabad- 431005 (MS) India. He is teaching, Drama, Theatre, Film, Indian Writing in English and Comparative Literature from last 20 years. He is working in amateur theatre for last 23 years and wrote four plays two one act plays in Marathi language. As an active translator, creative writer, theater activist he has delivered lectures across the state on theatre and environment. Film studies and its role in changing socio-cultural- political milieu is the topic of his interest focusing on the gender and human rights, research on Indian dramatist in various Bhashas across India is the area of his studies. He has bagged various prizes for light designing at state level drama competition of Govt. of Maharashtra. He has joined FSLE-India as its one of the Coordinators of Maharashtra Region. 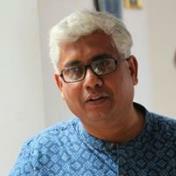 He is also a life time member of FSLE-India, an International Organization working in the field of Ecocriticism.